OFFER AN ORIGINAL GIFT: contact us for more information about a Canopée Lit Gift Card. The Short Story of a Big Team! It all began with a trip to Canada in September 2008 and an unexpected meal on the shores of the Fjord and a breathtaking sunset. A forest was for sale. We thought: Why not? We could build cabins up in the trees! We were a small group of people from France - a mother, her daughter, her son, son-in-law, two grandsons and a nephew. We all set to work! Each of us has our own particular skills and favourite interests. Each of us has found our role in the dream. May you discover your dream here as well! 24 wooded hectares, 3 streams, one of which has its source directly within the forest, 5 km of trails and 8 bridges, 1 heron, 3 goats, 312 hares, 518 squirrels, and sometimes even a bear or two! We hope you will take some time out to go for a fascinating walk while you're here. And to guide you, we have created in 2015 a nature trail and a booklet listing 18 plants and trees found in the Boreal Forest. The booklet is available for purchase at the Front Office. Canopée Lit : How and why? Ideas, sketches, conversations with neighbours, coffees, planning around the table, travels, the past, the future, the present. From our time and ideas is born this wild project: Canopée Lit. Climb up and feel the clean air of the forest, perched in a tree. We offer you a Cabin Concept. With some water, but not too much, some electricity, but not too much. Perhaps happiness is not where you expect to find it... Rise up, and you will see! All-Season Cabins: Warm and welcoming, these were our first forest constructions! Local artisans accompanied us for the construction and installation in 2010. We did it! The adventure had begun! Summer Cabins: Coming up next, their construction took place in 2013. After three years up and running, and after much contemplation, we were back in our workshops drawing up new plans and building more cabins. 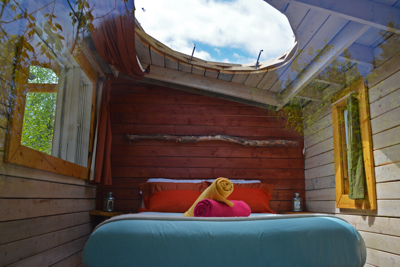 Romantic and light-weighted, we innovated with a glass dome in the ceiling above the beds. Bubbles: A wild, new concept. Our bubbles were hoisted up to their platforms in the Spring of 2014. We keep developing new products to diversify your experience. No time for boredom! Subsequent cabin generations will be innovative and inspired, fulfilling crazy and unusual dreams. 2 persons max. (12 sq. m, 6 m high). Double bed, small table and bench. Open-air kitchen: gas for cooking, sink, crockery, cutlery and utensils. No fridge. Mattress (45 cm x 120 cm) for young children and foldable cot for babies available upon request. The 4-season cabins will be closed from October 28th, 2018 to May 17, 2019 inclusively. 4 persons (18 m2, 6 m high). NOTE : No running water in winter, but a small reserve is available. Shower facilities available at the Front Office. Mattress (45 cm x 120 cm) for young children and foldable cot for babies available upon request. Additional mattress available for young children, as well as foldable cots for babies. Private bathroom equipped with dry toilet, shower and sink. Organic soap and shampoo provided. Kitchen and barbecue available at the front office from 1:00 p.m. to 9:30 p.m. Cooking in the bubble is prohibited. NB: The temperature in the bubble varies according to the outside temperature, just like inside a tent. If you are interested in purchasing a bubble for your personal use, do not hesitate to ask us for more information. Kitchen and barbecue available at the front office from 1:00 p.m. to 9:30 p.m. Cooking in the bubbles is prohibited. Find yourself at 17 feet high in the sky! Look down on a plain of young, syrup-laden maples, alders and spruce trees. Behind the cabin grows a beautifully inclined silver birch. Meanwhile, a rare and very tall hundred-year-old elderberry tree shades the terrace. The Bouleau penché Cabin is the summer cabin nearest to the forest entrance : it’s only a 3-minute walk. 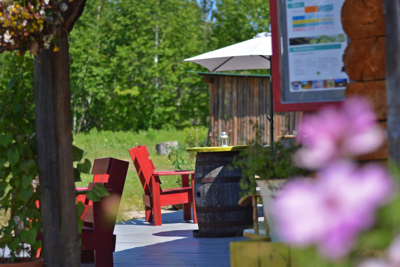 For families or groups of friends, the Bouleau Penché and the Plaine d'érables cabins are a mere 50 m apart. Here, you are King and Queen! After a 9-minute walk along the main trail, take the short, uphill path to the Côte Carrée Cabin. Once you have settled in, you won't want to leave. From your private terrace, you can see the spruce forest to your right, silver birches to your left, and alders before you. Raise your eyes a little and you will see the Fjord! For families or groups of friends, the Petit Plateau and the Côte Carrée cabins are only 20 m apart. On the left, after leaving the uphill Passage du Loup, which may leave you a bit short of breath, you will arrive at Le Petit Plateau Cabin. Just a few steps up and you will find yourself on the cabin terrace, where the Saguenay Fjord unrolls before you! At your feet lies a plantation of maples, with silver birch trees to your right and aspen trees to your left. For families or groups of friends, the Petit Plateau and the Côte Carrée cabins are just 20 m apart. Here, you are close to little trails perfect for a solitary walk. Keep an eye out for the squirrel hidden in the aspen observing you. The heron takes his nap by the river just below. 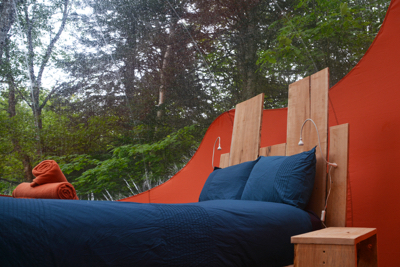 You can also watch them through the ferns, the alders and the Great Trembling Aspen from the vantage point of your terrace. Beneath the cabin's long stilts runs the Eau Frette stream. Listen, the water is singing! Cedar and Silver Birch trees surround the stairway up to the cabin. You can see and smell the freshness of the forest trees from the terrace: silver birch trees, cedar trees, maples, alders and aspen trees. 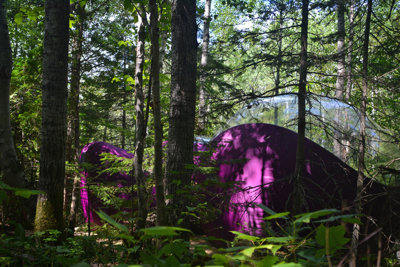 L'Eau Frette is the nearest cabin to the forest entrance; you will be the first to get there! It’s a short 4-minute walk. 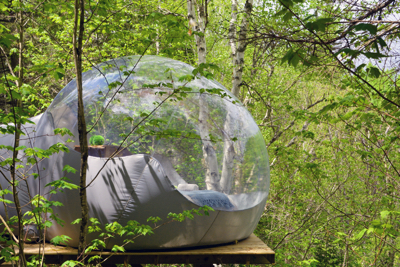 La Bul’Haute bubble is a completely spherical and transparent room perched on 18-foot stilts. After a short walk through the forest, you'll reach your special private domain. Enjoy the stars, the fauna and flora from your see-through sphere. At night, in your bed, wrapped in your down blanket, the bubble will disappear and you will see only the starry sky. You will not want to close your eyes! 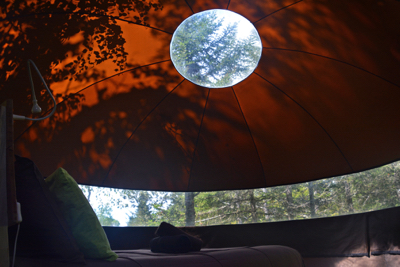 Les Ti Bouleaux bubble is a completely spherical and transparent bubble with a diameter of 4 m, perched on 10-foot stilts in the woods. After a short walk through the forest, you'll reach your special private domain. Enjoy the stars, the fauna and the flora from your see-through sphere. At night, in your bed, wrapped in your down blanket, the bubble will disappear and you will only see the starry sky. You will not want to close your eyes! The height of the bubble provides a well-hidden getaway and a wonderful view. Les Gros Bouleaux bubble is a completely spherical and transparent bubble with a diameter of 5 m, perched on stilts in the woods. It is the most spacious of our two-person bubbles. After a short walk through the forest you'll reach your special private domain. Enjoy the stars, the fauna and flora from your see-through sphere. At night, in your bed, wrapped in your down blanket, the bubble will disappear and you will see only the starry sky. You will not want to close your eyes! La Cosmos bubble is a double, completely spherical, transparent bubble. Two assembled spheres with diameters of 3 m and 4 m are perched on stilts in the woods. One double bed and two single mattresses lie on the floor under the starry sky. After a short walk through the forest, you'll reach your special private domain. The height of the bubble provides a well-hidden getaway and a wonderful view. La Boréale bubble is a completely spherical and transparent room perched on 15-foot stilts. La Reboule bubble is a double, completely spherical, transparent bubble. Two assembled spheres with diameters of 3 m and 4 m are perched on stilts in the woods. Breakfast, sheets, towels and luggage service are included. Payment: 100% will be debited on reservation. Cancellation policy : 20% of the total invoice is non-refundable. 100% of the invoice is non-refundable within 15 days of arrival date or in case of non-attendance. We welcome you between 3 p.m. and 6 p.m. in the summer, and from 3 p.m. to 5 p.m. in the winter. For your comfort, we advise you to arrive before it gets dark. If you are unable to check-in during office hours, please notify us as soon as possible. After checking-in at the front office, you may park your car at the forest entrance. From there, a short walk will take you to your accommodation. The nearest is a 3-minute hike, the farthest is 13 minutes. Please wear appropriate shoes. Light luggage is advisable, and you may take advantage of our luggage delivery service. You will find a bookshelf containing books and games, Wi-Fi access as well as hot beverages. In the summer, you can take advantage of the garden, the patio, the campfire and the volleyball field. Toys for kids and soccer balls are provided. The 4-season cabins and the bubbles are supplied with 110 V electricity. The summer cabins are supplied with 12 V. You can charge your devices at the Front Office. All the cabins are equipped with a kitchenette, where you will find a gas stove, a sink, utensils, dish soap, plates, glasses, dish towels, cooking pots and pans, a coffee maker, a few cans of butane, water, salt and pepper. Refrigerators are available in the 4-season cabins. Eating in the bubbles is prohibited. Clients staying in bubbles have access to the kitchen and the barbecue at the front office from 1:00 p.m. to 9:00 p.m. Restaurants, a grocery store and a liquor outlet (SAQ) are available in the village. We can suggest the best restaurants upon arrival! Breakfast is delivered directly to the cabins every morning. Bubble clients can have breakfast at the Front Office Building. Brunch is available at an extra cost of $9.50. Animals and pets are prohibited in our accommodations. We live in a very beautiful region, we hope you will make the most of it! You can book your activities online when reserving your cabin, or when you check-in at Canopée Lit, according to availabilities. Please don't hesitate to contact us for any further information! L'Anse de Roche: it's lovely ! You must go down to see the pier at l'Anse-de-roche while you are here. At low tide, you can walk along the banks and chat with the locals sitting on the terraces of their brightly-coloured chalets bordering the shore. Ecological cabins at "Domaine Floravie"
Our ecotourism accommodation cabins are situated close to the Saguenay Fjord, at l'Anse-de-Roche. From Tadoussac, take Highway 172 West to Sacré-Coeur (19 km). Drive through Sacré-Cœur. Four kilometres beyond the village, turn left towards l'Anse-de-Roche. After the Herbamiel Honey Farm, the entrance to Canopée-Lit will be on your left.